The country strives to attain the gross domestic product growth rate of around 6.7 percent, the export revenue growth rate of 10 percent and the consumer price index at below 5 percent. The proportion of poor households and poor districts will respectively reduced by 1.3-1.5 percent and 4 percent. Meanwhile, the urban unemployment rate will slash to below 4 percent. The above targets are set forth in Government Resolution No. 01/NQ-CP of January 7, on major tasks and solutions to direct the implementation of the 2016 socio-economic development plan and state budget estimates. 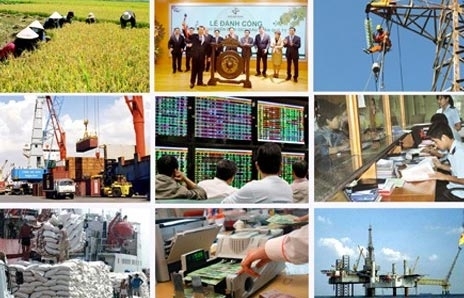 In order to achieve these targets, the Government requests the State Bank of Vietnam to coordinate with ministries, agencies and provincial-level People’s Committees in realizing monetary policies in a flexible and active manner and closely combining them with the fiscal policy and macroeconomic policies to control inflation, ensure macroeconomic stability and boost economic growth. The Ministry of Finance is requested to further restructure state budget revenues without issuing new policies that decrease budget revenues, except for tariff cuts to implement treaties. The Ministry of Planning and Investment is asked to strictly control public investment in terms of objectives and efficiency and concentrate investment credit loans on important and urgent projects that have great impacts on socio-economic development. The Resolution also requires ministries, agencies and local administrations to further improve the legal system and enhance the effectiveness of law enforcement in order to create a uniform and favorable legal framework for production and business activities.